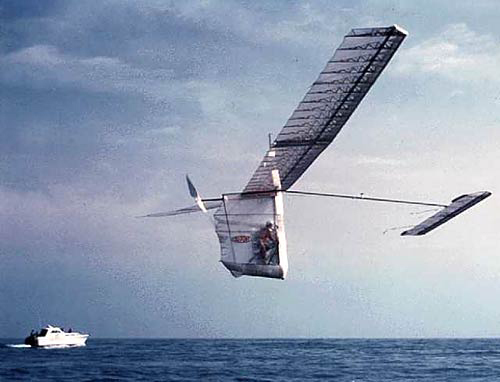 On this date in history, June 12, 1979, the first successful crossing of the English Channel in a human-powered aircraft took place. Bryan Allen flew the Gossamer Albatross across the English Channel powered only by the pilot pedaling a bicycle-like contraption that drove a large two-bladed propeller. How long did it take to fly across the English Channel in the first human-powered aircraft? This entry was posted in Trivia and tagged albatross, flight, gossamer, human, powered, record on 06/12/2014 by N6CIZ.